We have 20 BlizzCon 2018 Virtual Tickets up for grabs! BlizzCon 2018 is happening across November 2 and 3 in California which, for many of us, is a world away. For Blizzard fans who can’t make the long-haul flight to California to attend the show then, fear not, as Blizzard has once again released a ticket just for you – the BlizzCon Virtual ticket. It normally costs £34.99 but we’re feeling generous so we’re giving 20 Virtual Tickets away – but to Europeans only, sorry. The Virtual Ticket gets you access to two months of exclusive livestreams covering all of BlizzCon’s news and events, and the panels that’ll be at the show. You can access this content from the BlizzCon website, directly from BlizzCon’s desktop app Battle.net, and also on your mobile with the BlizzCon mobile app. That means you can watch the event schedule unfold from anywhere, which is handy if you don’t want to miss that mysterious and massive Diablo news – Diablo 4, maybe?. You’ll also be able to take part in several BlizzCon Build-a-Panel polls giving you a say in who you’d like to see. Virtual Ticket holders will also get a discount on the official BlizzCon goody bag as well as join regular BlizzCon tickets holders in receiving the first of many in-game items: a legendary skin for Overwatch’s Sombra that channels the iconic Demon Hunter class from Diablo III. 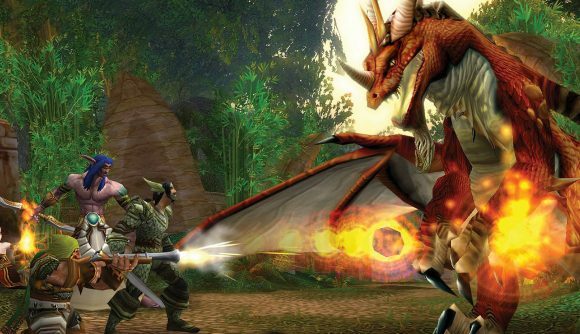 Another freebie, announced by Blizzard last year, is that you’ll be able to get your hands on that World of Warcraft Classic demo if you buy a Virtual Ticket. There’s a lot that comes with the Virtual Ticket, which are available to buy now for $49.99, but lucky for you we’re giving away 20 BlizzCon tickets for free! Please be aware that, unfortunately, our giveaway tickets are only available for EU residents only. In order to win a BlizzCon Virtual Ticket, all you need to do is enter the competition via the widget below. After meeting the first requirement in the widget you will be shown four possible actions you can complete to enter the competition. Complete all four and you’ll have entered yourself in the giveaway four times, increasing your chances of being a winner. We’ll need your email address so we can send you a code upon winning – we won’t send you spam, we promise. Please read our terms and conditions before you enter.